19th August, 2004. In this issue: Back in Print - New Editions, New Products, July Site Stats, Business Search Listings and Show Your Support. Don't put up with socks this Father's Day (Sunday 5th September), get yourself (or someone else you know) a really useful gift from the ExplorOz Adventure Shop. How do you keep up with changing regulations and track closures for 4WDing near Perth? This latest edition contains the best spots where you can currently go 4WDing near Perth. Just released this week its a must have for all Perth 4WDrivers. Smaller than the "Super Map", Hema's Large Australia map is another ideal wall chart and is available as a flat map for this specific purpose and comes with or without lamination. This popular map is now available as a flat map (ie. not folded) and is great for planning trips or for creating an interesting wall chart. Available either with or without lamination. Site traffic has increased with 278,698 visits for the month of July. Our August figures are also looking high and we are predicting we'll record 300,000 visits for the first time ever. the number of pages viewed throughout the month also remains fairly steady at 1 million (1,080,839). Unsubscribe or edit your profile for receiving this Newsletter by using the "MANAGE" link from the bottom of this newsletter. 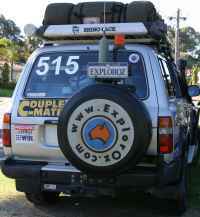 The Business Search part of the ExplorOz site is quickly growing with more listings appearing all the time. All listings include full contact details and links plus a full description of their services/products. Either search the directory by keywords or select a category and/or region to find a supplier.